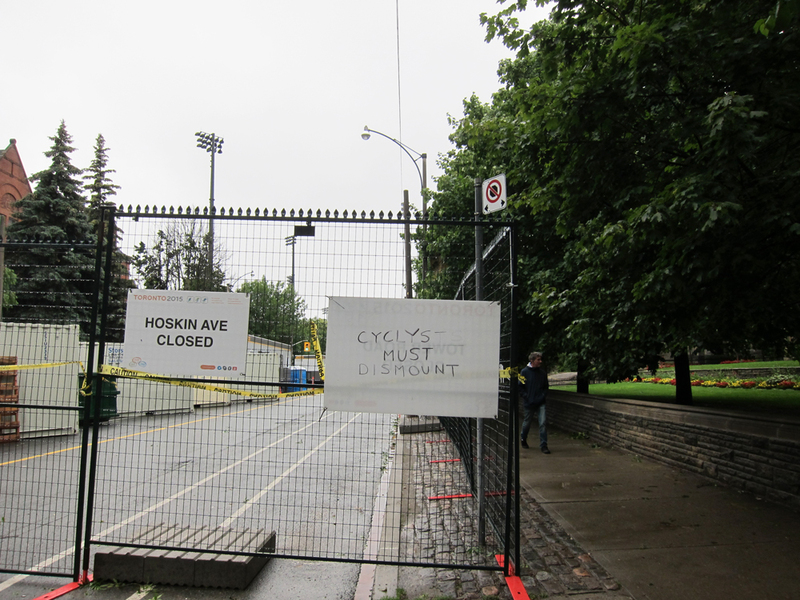 A sign erected on June 25 indicates the closure of the Hoskin bike lane for two months. 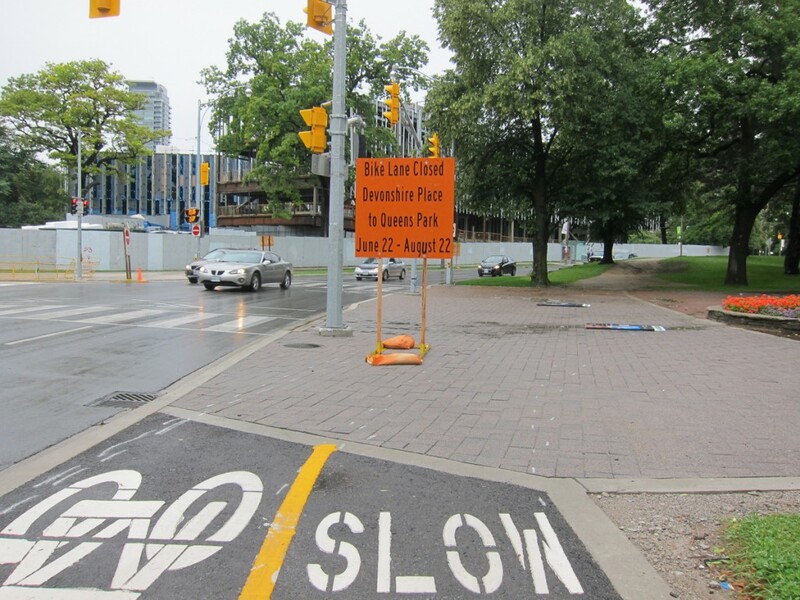 A sign erected on June 25 indicates the closure of the Hoskin bike lane for two months during the Pan Am Games. City staff confirmed that no alternative is being provided. 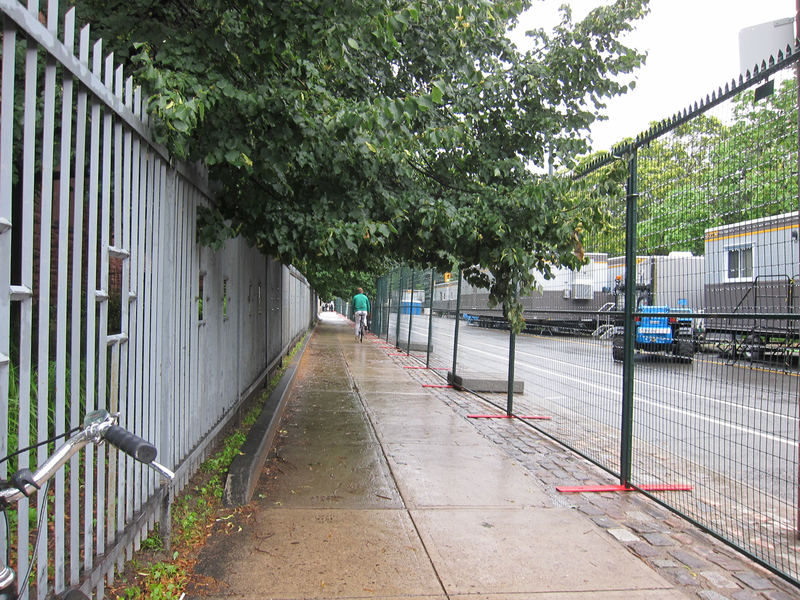 That means the 4,000 cyclists that use the Harbord/Hoskin bikeway daily are now expected to walk their bikes on the crowded sidewalk on the north side. Considering the city just installed it's first bi-directional bike lane around Queen's Park Crescent -- effectively making the Harbord/Hoskin bikeway even more popular due to it's better connectivity to Wellesley, it is dismaying that the city would provide no alternative, nor make any attempt to provide a detour, to such an important bit of connecting bikeway. Harbord successfully moves thousands of cars and bikes on the daily, and bikes make up about 40 per cent total traffic during busy week days. 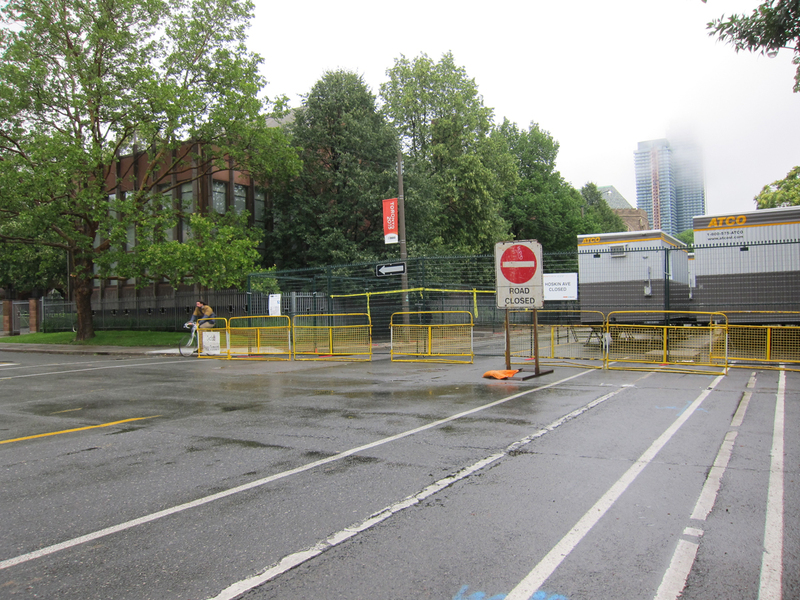 I am not a planner but I might suggest that cyclists could detour around the back of the Munk School through the parking lot and over to Devonshire to continue on the Harbord bikeway. Or perhaps pedestrians could cut through the university and cyclists could use the sidewalk as a bike lane in the interim. 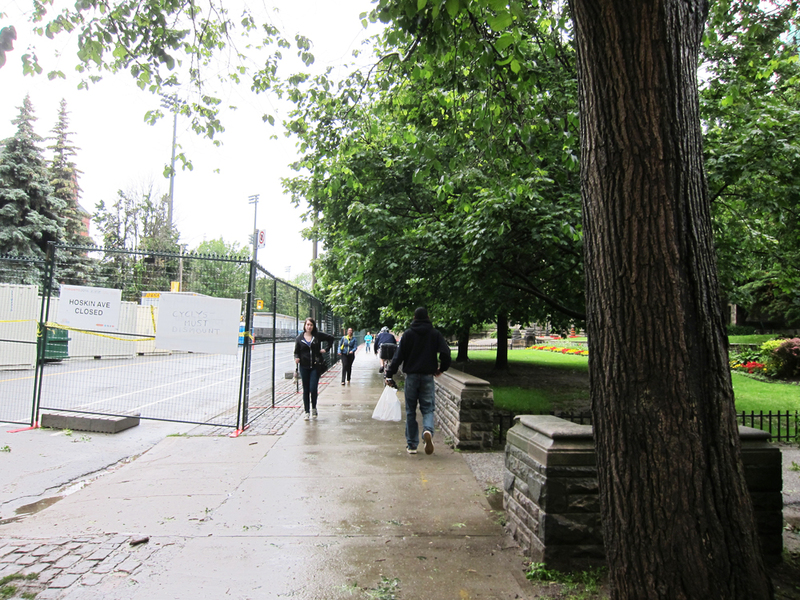 Philosopher's Walk will get you up to Bloor, but it's also cobblestoned and pedestrian-filled and is no help at all if you want to stay on the Harbord bikeway to get west (as 4,000 other cyclists a day do) ... oh and, we do not (yet) have bike lanes on Bloor. Um, okay, so scratch the Philosopher's Walk suggestion. I'll also note that Tower Road is closed (just in case you were thinking of a south cut through). "Please" is a nice touch on this sign.. But it wasn't very effective. 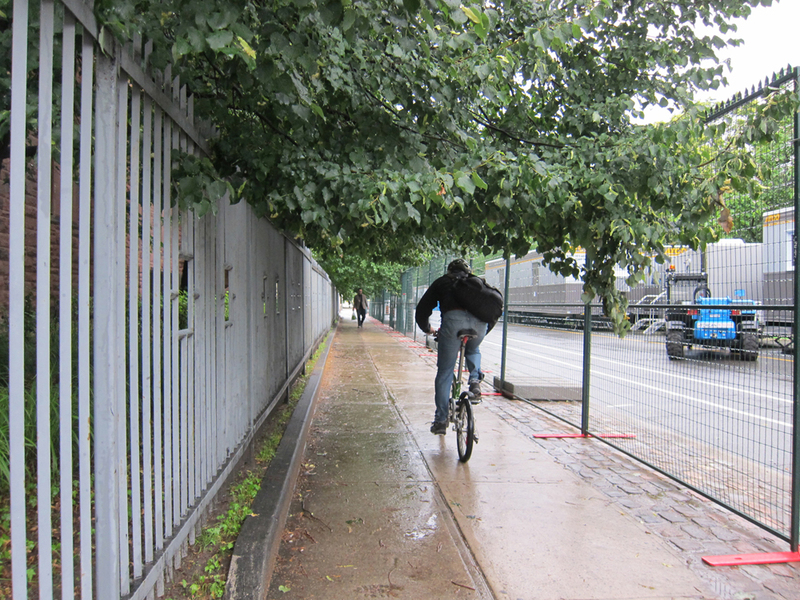 In the VERY short time (on a very rainy weekend afternoon) that I was there, I saw six or so people biking on the sidewalk. I did NOT take these photos to shame anyone. 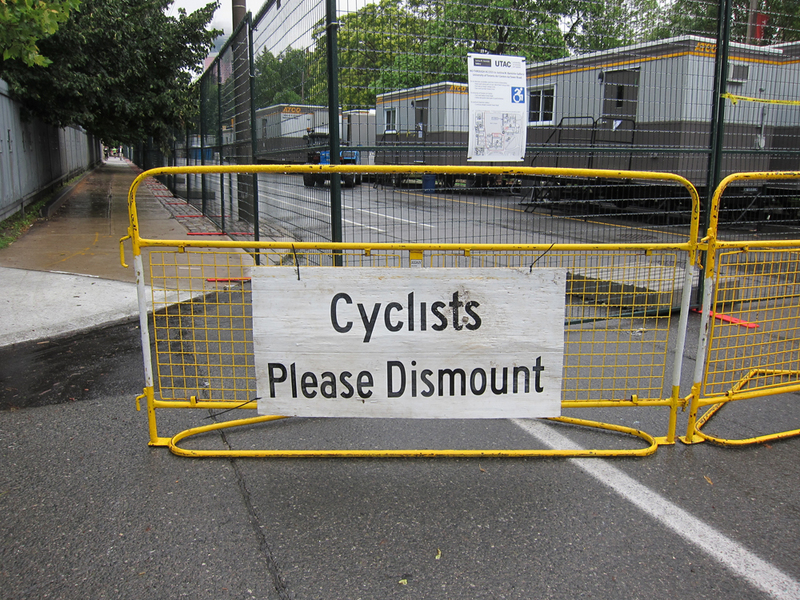 I took them simply to illustrate that cyclists are not going to dismount for such a long distance, on a bike route, with no alternate route provided. 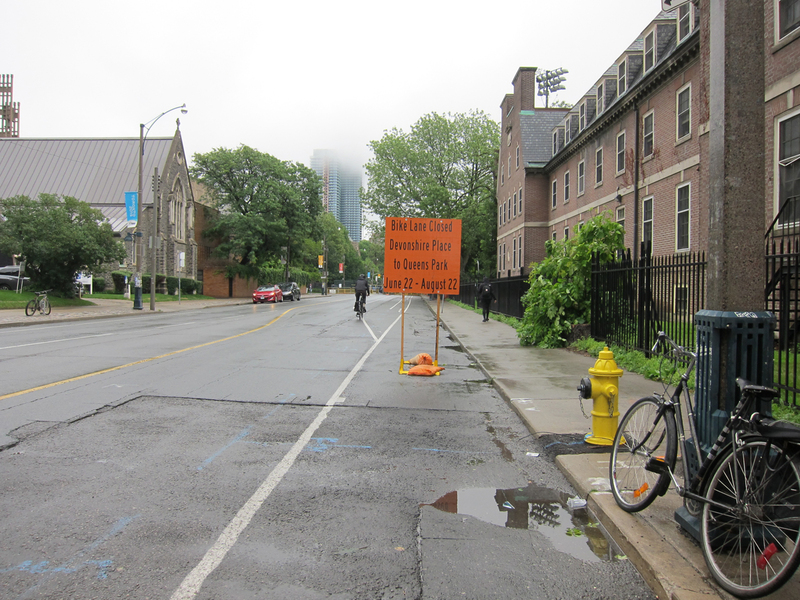 "The bicycle lanes on Hoskin have been blocked just west of Queens Park to Devonshire (approximately 200 m), due to the TO2015 Pan Am Games. 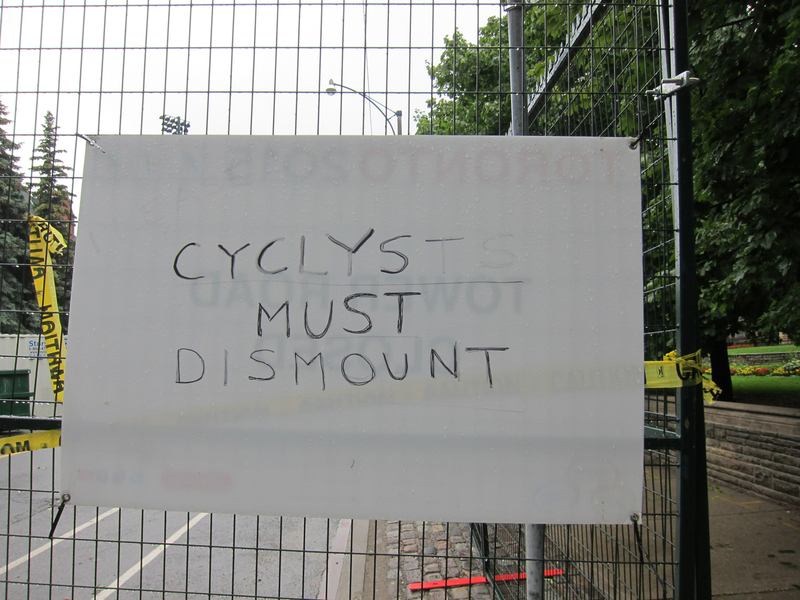 The sidewalk will be open, and "dismount and walk" signage [...] up for that section. We considered suggesting alternate routes, but given the closure is so short, any alternate would likely be less convenient." One of the bikers I saw take the sidewalk was with a popular food delivering service. Couriers need to get to where they are going fast and Avenue Road is not a connecting alternative for cyclists -- more like a deathtrap to nowhere. Definition of 'detour' is: a divergence from a direct or intended route, esp. one that avoids a blocked road. In the case of the Hoskin bike lane, no detour has been considered or offered because it "would likely be less convenient." We can do better Toronto! Cyclists deserve safe passage just like everyone else and if the city is serious about getting more people moving it would never shut down an important bike lane for two months without providing an alternative route. 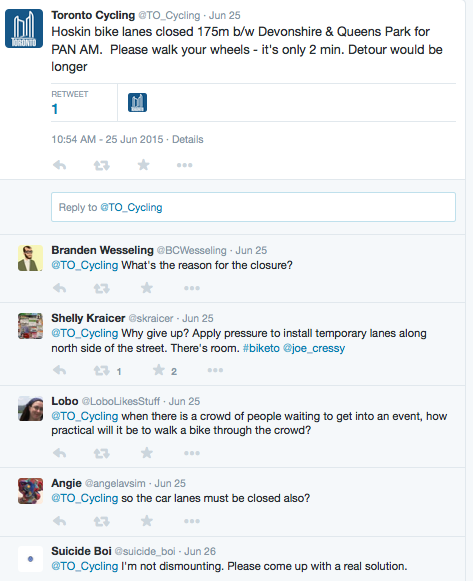 It's contrary to the city's proclaimed goals of encouraging more active transportation to shut down one of the only major east-west bike lane connectors for the summer. Summer is when we get fair-weather cyclists -- and they need those bike lanes. It simply doesn't make sense that we'd encumber physical activity to make room for an event all about physical activity -- during a time when our city's leaders are endlessly fretting about mobility and gridlock. Write to or Tweet at councillor Joe Cressy and the city's cycling unit to ask that a detour be provided for cyclists during the long closure of this crucial connecting bike lane. 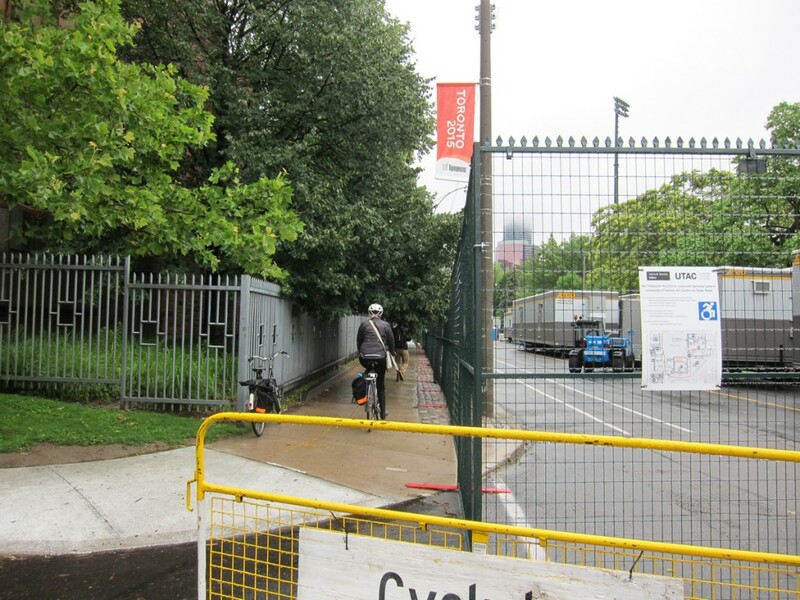 Bike Spotting on Queen's Park Crescent: What do you think of this new bike lane?